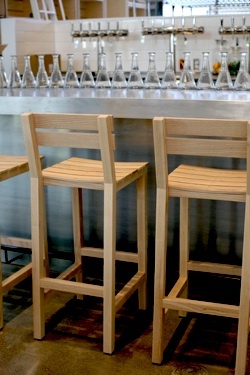 The stools look great lined up at Shed’s lovely zinc wine bar (photo: Naomi Mcleod). I’m very proud of my new barstools for Healdsburg Shed. I designed and made a batch of eight for use at Shed’s wine bar, and they will soon be available for sale as a made-to-order item for Shed, along with my matching Cafe Chair and a version of my Community Table. Both chair designs are made from Oregon white ash, finished with a matte clear coat to maintain the wood’s natural blond glow. I’m considering offering a dining height version of the barstool, and possibly a version in a darker wood, maybe walnut. To read more about my furniture design for Shed, click here and scroll down. Early sketch of my Shed Cafe Chair concept. I think of the new line of furniture I designed for Shed as belonging to the same extended family. Consisting of just four unique pieces- a café chair, a barstool, a ‘community’ table and a multi-use, ‘demonstration’ table, the line evolved slowly over the past two years, or co-evolved, along with Cindy Daniel’s vision for Shed as a ‘modern grange’. Jensen Architects set the bar high by designing such an elegant building, whose pared down modernism manages to evoke agricultural vernacular without succumbing to nostalgia or rusticity. I’m grateful that Cindy included me in early meetings with the architects as focus shifted to the building’s interior. Before actually designing anything, I had a hand in shaping a design direction, inspired by the region’s agricultural legacy and Healdsburg’s historic role as a major hub. My eyes turned to things like pallets, packing crates, fences and barns for inspiration, and I made a series of experiments and prototypes, leading eventually to a cogent formal language. The entire process was highly collaborative, a triangulation between the building itself and its built-in components, the functionality of the space, and the emerging ethos behind Shed’s product line and services. 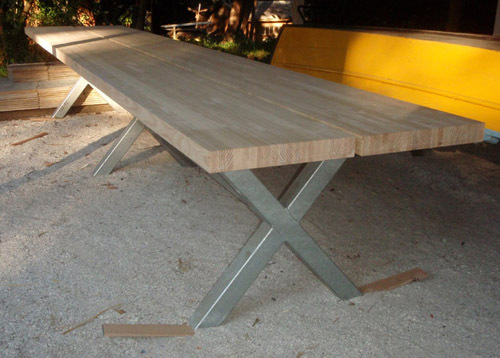 My first breakthrough came with a concept for a massive table that would double as a method of curing wood I milled myself from locally-sourced ‘horticultural salvage’. A giant slab of unfinished sycamore would rest atop two stacks of neatly stickered wood, the weight of the slab ensuring the drying boards not warp. 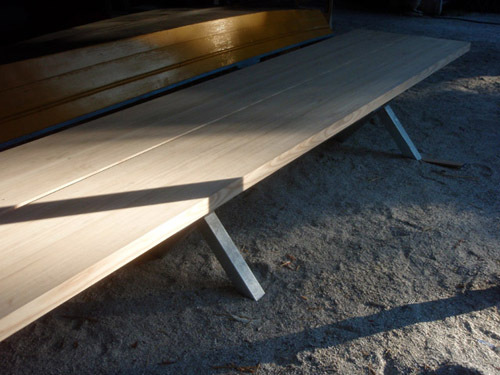 Each year, when the wood was adequately dry, it would be removed from under the table and made into something useful for Shed, either in the form of a limited production product for sale, or as an item for use in-house. The dry stack would be replaced with freshly milled boards and there would be a year to decide what to make with them. I love the idea of a table that also functions as a kind of ‘crowd source’ process piece that gives me an ongoing role as Shed develops over the years. To prototype the table, we milled a pecan tree and laid it up under the sycamore slab to dry over the past year. I’m now making pecan tabletops for the café, and the remainder is being made into small serving platters. The first iteration of my Demonstration Table, set up to dry a load of pecan wood. 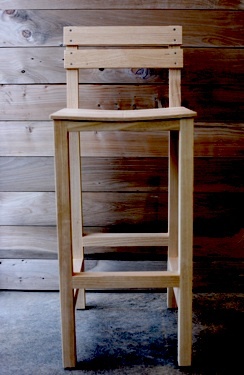 The next piece to emerge from my experimentation was the barstool, which I conceived as just a very high, simple chair, like a lifeguard stand. I didn’t want it to appear ‘designed’, but more like what might pop into your head if you heard the word ‘chair’, only taller, kind of high waist-ed. I also wanted it to evoke a character by its posture and the way it was put together, very straightforward and rigorous, screws exposed, made to last but repairable, practical like a farmer. Farmer Modern. I made the prototype with cedar I had on hand but knew the stool needed to be made of white ash for Shed. Ash is very pale, with a pleasingly straight grain, excellent strength to weight ratio, and is used extensively to make tool handles, baseball bats, lobster traps and boat parts like thwarts and tillers. 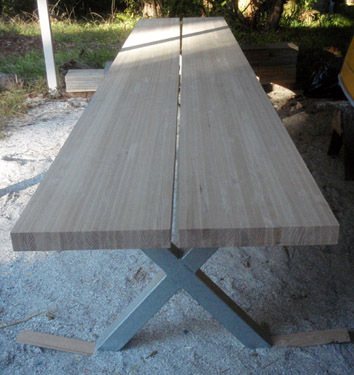 I’ve always thought of white ash as a quintessentially American wood, and it grows throughout the deciduous forests of the US and Canada, so is available FSC-certified at a reasonable cost. Prototypes for the Shed Barstool and Cafe Chair, to be slightly modified in production. 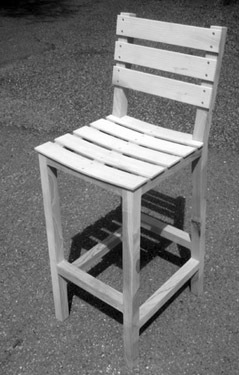 The Café Chair developed next from a structural experiment. I had an overstock of vertical grain Douglas Fir lathe I had been making into stickers for drying wood, dimensioned rough at about 1” x 2”. The lathe is milled nearby in Cazadero, sold as offcuts from making dimensioned lumber, so it’s very inexpensive despite its straight, clear grain. I thought it would be a great challenge to make a comfortable dining chair using only lathe and a single fastening system; it would also be in keeping with the Modernist Farmer character I had invented. The experiment mostly worked, producing a reasonably strong, somewhat comfortable chair, but it needed tweaking. I abandoned the narrow parameters of using just 1 x 2 lathe, but kept the basic form, dimensioning structural parts for greater load bearing, and seat and backrest parts for greater flexibility and comfort. I made the next prototype in ash to complement the barstool. The new chair retains its airy permeability and still evokes the homemade-modernist paradigm, but also meets the requirements of comfort and durability. With its slat construction, exposed screws and whitewash finish, the chair shares elements with the barstool while exerting its own personality. The two are obviously related, but don’t match at the expense of their individuality. I assembled the Shed Community table outside my studio for a trial fit. By now I knew where the furnishings would be in the space, how they would interrelate and what would surround them. I just needed to design a very long Community Table for the center of the dining area, and it needed to anchor the collection and choreograph movement through the space. Because the 15’ 6” long table would be shared by people who did not necessarily know one another, I wanted to imply that it could be infinitely long, a table for everyone to gather round. I also wanted the table itself to be extremely minimal in order to draw attention to the food and the collection of people and how they naturally compose themselves. Knowing that Cindy was keen on using backless stools for seating, I also wanted the table to appear to be floating, to be as unobtrusive as possible, a meeting place more than an imposing thing. I pictured two identical boards running parallel to each other, separated by a narrow gap, allowing air to circulate through the middle of the table, unobstructed. 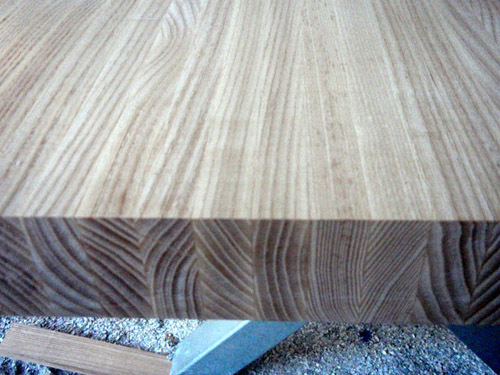 I decided to make the boards of glued laminations of white ash, cut from full-length stock so there would be no seams. The boards are mounted on a base of three X-trestles made of 3” square tube, welded together and hot-dip galvanized, like farm equipment or fencing. At 33” wide the table invites intimacy while allowing more room for circulation around the space. I’m very proud of the Community Table and am excited that Cindy will be offering shorter versions for sale through Shed on a commission basis. Working with Cindy and designing these furnishings for Shed over the past few years have been among the most challenging and rewarding endeavors of my career. We share a deep philosophical alignment and I’m truly honored to have been part of bringing Shed into being. I’m confident Shed will become a vital mainstay of the community and a major destination in the Russian River Valley. To read more about the development of Furnishings for Shed, please click here and scroll down. I took advantage of a break in the storms to mill two black acacia logs with my friend Shawn Gavin. One of the logs had unusually wide sapwood and neither had many branches, so we boule cut them both at 5/4″, leaving live edges. 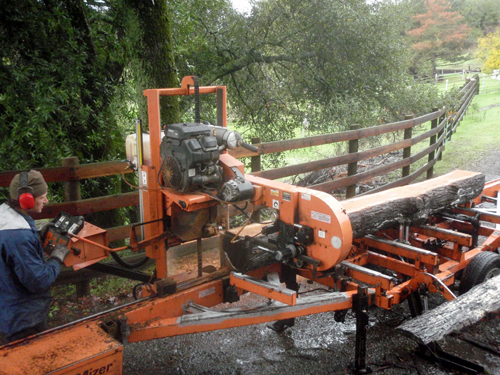 The logs were still pretty green but had been sitting for long enough to loosen the bark, most of which peeled off easily as we rolled the logs into position on the mill. I’ll sticker the stock under the weight of a giant sycamore slab for Shed, as the latest incarnation of my Demonstration Table. We recently harvested the pecan we had drying under the slab to make tabletops and serving boards for the Shed cafe, and I’m excited to load up a new batch of green wood before Shed opens to the public in early 2013. We’ll have a year to decide how best to use the black acacia with the wide sap as it slowly cures. 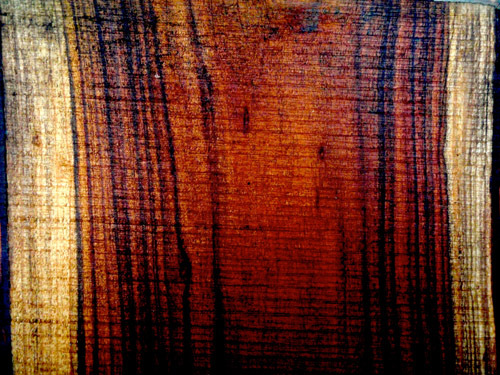 A relative of koa, the wood is prized for furniture and instrument making, and is believed to be the wood Noah used to build his ark. It’s Latin name, Acacia Melanoxylon, apparently translates roughly to ‘bad actor’, a reference to the tree’s behavior in the forest as opposed to the character of its wood. At 16′, the table is the same length as Calabash, my homemade rowing/sailing sharpie. 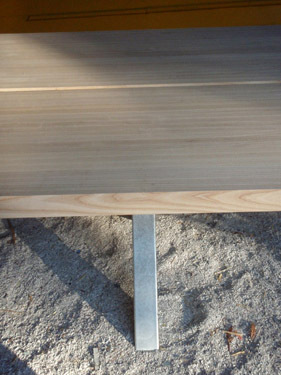 Here’s a glimpse of the Community Table I designed for Shed Healdsburg. I assembled the parts for the first time to take progress photos for the client before making final adjustments and finishing the top, and was excited to see the table come together as I had imagined it. Consisting of two identical planks of full length, laminated ash, the 16′ top rests on three X-trestles of welded, galvanized steel. The modular concept lends itself well to different versions of varying length and wood stock, and the easily (dis)assembled parts ship practically flat. I plan to make shorter versions with two trestles available for sale exclusively at Shed. 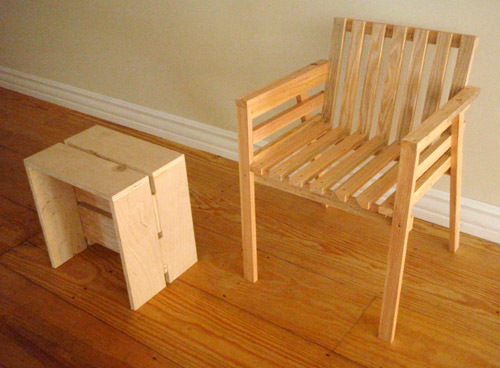 My latest Simple Chair prototype is ready for presentation. Following some welcome critique with the client I’ve modified the design of my Simple Chair and made a new prototype. 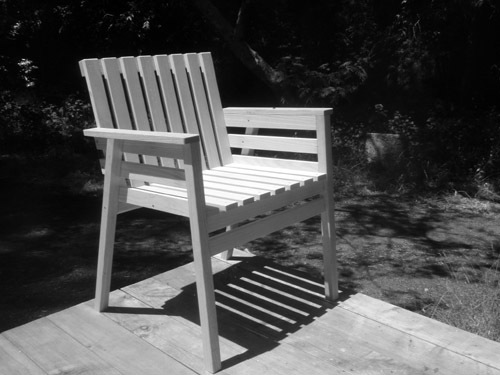 The new chair is a little wider, with a slightly taller backrest, more mortised joints, beefier legs and wider but skinnier components, all realized in white ash from the Pacific Northwest. My original concept was pretty close to the mark, but was wanting in comfort and stability and held a bit too stridently to my desire to make a dining chair from one repeated part. The original spirit remains in tact, with improvements on all fronts. I’m going to recommend the chair be whitewashed with milk paint in production, a simple, non-toxic and easily maintained alternative to other paints and finishes. 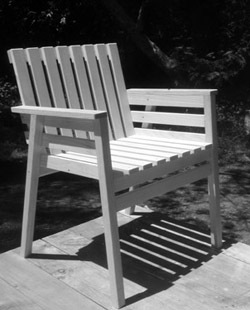 Simple Stool, Simple Chair, for Healdsburg Shed. The challenge has been to create a harmonious range of seating options to support Shed’s culinary offerings, which range from a coffee bar to intimate dining at small tables along a banquette or at a large community table, to a wine bar, all happening simultaneously under one roof. I’m continuing to champion the themes of transparency and permeability, agricultural vernacular and a kind of generic minimalism, and it’s been exciting to finally see the building go up and be able to see things in context. I think we’re close to having a cogent collection to support the Shed ethos and brand. My goal has been to design furnishings that meet all functional and aesthetic criteria, but that are easy enough to be made or modified by any decent carpenter or cabinet=maker. I will be making the furniture myself, but I like the idea that the design is implicit in each structure and could be repeated and possibly improved with future iterations, like a folk song, where the idea of the thing can be as powerful as the thing itself. 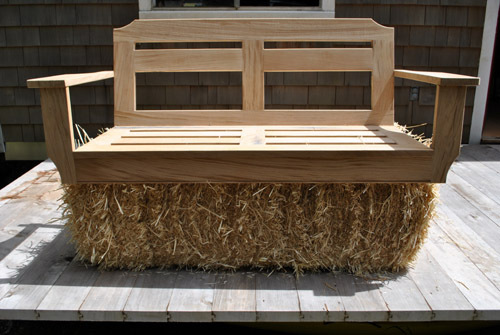 My Hayride bench sits on top of a straw bale for outdoor events. 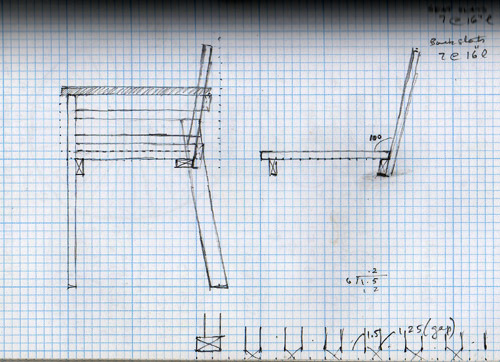 It’s been close to ten years since I designed and prototyped my Hayride bench concept. The first batch was commissioned for the Children’s Garden at Copia, a cultural and educational venue in Napa. I’ve since made small batches of the design, improving its construction and functionality with each iteration. Made from locally milled white oak, my latest model will be on display at showrooms in Sonoma and Healdsburg in anticipation of a production run this summer. I’m still working out Hayride’s manufacturing logistics and price points, but the design stacks for ease of packing and shipping, and I’m considering developing a folding version.